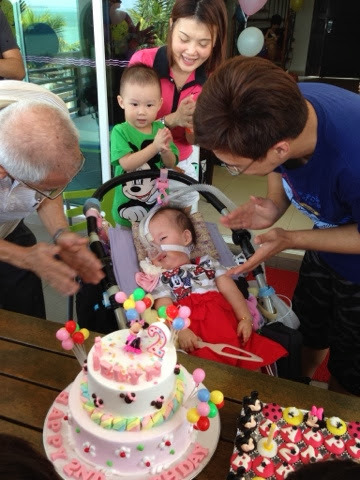 Yesterday we celebrated K’s 2nd birthday with a buffet lunch with some friends and relatives. What a U-turn for me. But it’s no biggie, just max 40 people. When Kaelyn was born, I told myself this little girl’s birthday celebrations is going to be very simple home affairs. No big celebrations when she doesn’t understand a thing going on around I say. I did it to celebrate a milestone. It is a milestone for K, that is, just to reach the age of 2. It is not easy for her to reach this age. The prognosis of SMA is not good for her age as 80% pass away before age of 2. Unwilling participant of countless physio sessions, hospital stays, blood tests and x-rays. We almost lost her a few times as she laid on the hospital bed, body already pumped full of oxygen, but still grasping for breath as her lungs collapsed. It is a trying journey for us as a young family. But this journey has been made much easier with the love, support, encouragement and prayers from our family, friends, support group and colleagues. She loves the songs and dances that some of the aunties put up for her. And even as you go about organizing your activities, you try to include her. Thank you for bringing part of your world to her. And for these we are grateful and thankful for. And Thank you for putting smiles in my little girl’s life. More years to come kaelyn! Happy bday! You have made your parents very proud..